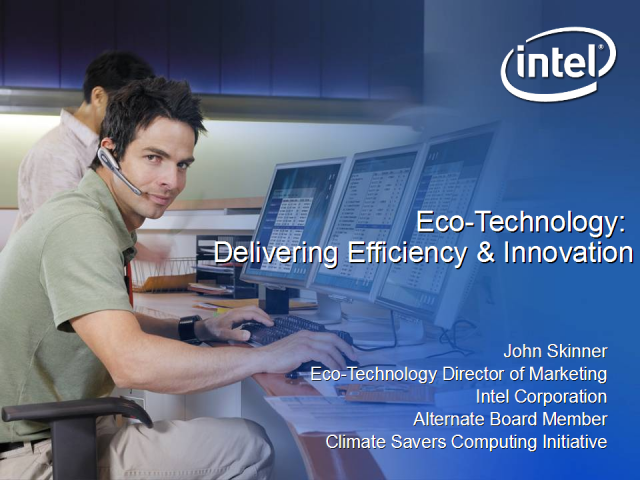 Intel’s approach to Eco-Technology spans several disciplines: Sustainable Operations, Designing for the Environment, Energy Efficient Performance, and Policy and Initiative Leadership via consortia such as the Climate Savers Computing Initiative. The 2% Opportunity: Information and Communications Technologies (ICT) are responsible for approximately 2% of global CO2 emissions, and there are innovations we must pursue to mitigate this footprint. These include taking advantage of Moore’s Law to improve the energy-efficiency of each generation of new computers, as well as implementing existing Power Management solutions as recommended by the Climate Savers Computing Initiative. I will highlight the upcoming March 30 “IT Power Management Webinar” to be co-hosted by the Climate Savers Computing Initiative, the US EPA Energy Star Program Office, and Forrester Research. The 98% Opportunity, IT as the Solution: On the other side of the coin, ICT can be more effectively harnessed to reduce the 98% of global CO2 emissions that are not attributable to ICT, in nearly every aspect of industrial and consumer activity. ICT can be more effectively harnessed to achieve carbon-reduction via innovative approaches to Automation, De-Materialization, and Substitution of carbon-intensive activities. Of particular urgency is the opportunity to harness microprocessors and open standards to help accelerate the development of the “Smart Energy” industry. The successful transformation of the energy sector to the “smart energy sector” requires that we accelerate the integration of, and synergy between, intelligent renewable energy sources, smart grids, smart buildings, and empowered energy consumers.